Clean. Bed was very comfortable. Heater kept room comfortable. New mattresses.hair dryer. Microwave. Fridge. New carpet. Nice flat screen t.v. Staff was cordial...rooms upstairs brand new....microwave and refrigerater brand new...bed was new and comfortable! No bed was lacking. Pillows were not comfortable. They don't use booking.com so it was a disappointment had to get a 2bdrm and couldn't get it when we reserved it. Weak coffee, hard beds, make your back ache beyond ache seriously, the wife is impolite but her husband and father are great. Don't get room 119 broken TV didn't pick up the regular channels. Very late check in not worth the price but when it's the cheapest on moment notice you have to. Good value, great location, clean, comfortable, great linens! Located in business area of city, but for me that was fine. The motel has seen better days, but all in all, it's adequate. It's far from the city center, but there's good public transportation to all the interesting sites and the airport. Considering how expensive Denver is, this is a good place if your traveling on a budget. The motel is an older one, without the bells and whistles you'll probably never use. The sleeping area is away from the front windows, so no traffic noise during morning rush. Bathroom was small but clean. Bed was clean and very comfortable. Belcaro Motel This rating is a reflection of how the property compares to the industry standard when it comes to price, facilities and services available. It's based on a self-evaluation by the property. Use this rating to help choose your stay! This 1950s-style motel on South Colorado Boulevard is 15 minutes' drive from the Denver city center and 7.3 k from the Denver Zoo. WiFi is available throughout the Belcaro Motel. Rooms feature air conditioning and free cable TV. Each private bathroom is stocked with amenities for convenience. The front desk is open 24-hours to assist guests’ needs. Ample parking space is available. 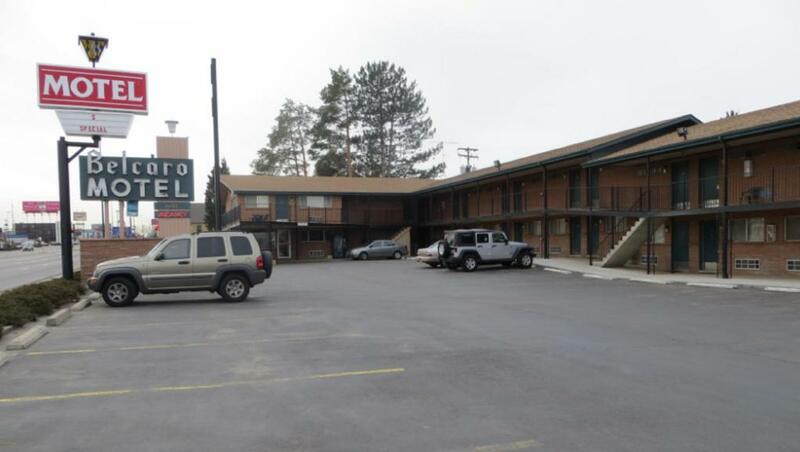 The Belcaro Motel is less than 2 miles from Washington Park and 7 miles from the John F. Kennedy Golf Course. When would you like to stay at Belcaro Motel? Cable TV, a refrigerator and microwave are provided in this room. House Rules Belcaro Motel takes special requests – add in the next step! Belcaro Motel accepts these cards and reserves the right to temporarily hold an amount prior to arrival. HBO guide provided. Couldn't find channel. I could hear the maid pacing outside my door 5 minutes before checkout and she was waiting on me at the door to leave. I was leaving on time, mind you, but she was definitely rushing me. Got a phone call as I was heading out the door at checkout. Again, I was on time. Just felt like they were rushing me, didn't really care about their customers. It's like they anticipated me to try and stay in the room all day, which I get, it's Denver, there's bums, but I'm not one. The room and facilities are well-kept. Pillows were hard. I think the dead bolt lock did not fully engage. My only complaint with this visit was: no hangers, slow sink drain, and I put a "do not disturb" sign on the door and someone came in and cleaned up anyway. I love this motel. Great convenient location in pretty good shape. Too much for What you get. Could use more mobility aids like toilet seat riser and more handles in shower.